Definition at line 1971 of file sampleMonoPoly.cc. Definition at line 266 of file sampleMonoPoly.cc. Definition at line 430 of file sampleMonoPoly.cc. 494 //if (leftGirdPoint, botVertex) interesects right chian or not. 499 ret_leftCornerIndex = index2; //should use tempI??? 538 //whether (rightGridPoint, botVertex) interescts the left chain or not. 543 ret_rightCornerIndex = index1; //should use tempI??? 584 //we check if (rightChain(index2), rightGidPoint) intersecs left chain or not. 588 ret_rightCornerIndex = index1; //should use tempI??? 627 //we consider if we can use leftchain(index1) as left corner. 632 ret_leftCornerIndex = index2; //should use tempI??? Definition at line 388 of file sampleMonoPoly.cc. Definition at line 974 of file sampleMonoPoly.cc. 1065 //and accordingly we should update the inner index. Referenced by findGridChains(), and sampleMonoPoly(). Definition at line 941 of file sampleMonoPoly.cc. Definition at line 850 of file sampleMonoPoly.cc. Definition at line 1092 of file sampleMonoPoly.cc. 1191 //and accordingly we should update the inner index. Definition at line 372 of file sampleMonoPoly.cc. Definition at line 651 of file sampleMonoPoly.cc. Definition at line 2011 of file sampleMonoPoly.cc. 2190 *two vertices on the two grid v-lines. 2234 *two vertices on the two grid v-lines. Referenced by sampleLeftStripRec(), and sampleLeftStripRecF(). Definition at line 1907 of file sampleMonoPoly.cc. 1922 /*output the fan of the grid points of the (i)th and (i-1)th grid line. Referenced by sampleLeftStrip(), sampleLeftStripRec(), and sampleLeftStripRecF(). Definition at line 1682 of file sampleMonoPoly.cc. 1699 * possily multiple grid lines. Definition at line 1724 of file sampleMonoPoly.cc. 1733 /*now top left trim vertex is below the top grid line. 1735 /*stop condition: if topLeftIndex >= botLeftIndex, then stop. 1744 * index1 could be equal to topLeftIndex. 1758 * below the second grid line). 1759 * Find the last grid line index2 which is above nextTrimVert. 1761 * leftGridChain, leftGridChainStartIndex+1, index2). Referenced by sampleLeftStrip(), and sampleLeftStripRec(). Definition at line 1803 of file sampleMonoPoly.cc. 1812 /*now top left trim vertex is below the top grid line. 1814 /*stop condition: if topLeftIndex > botLeftIndex, then stop. 1860 /*if leftChain->getVertex(index1) == secondGridChainV, then we can recursively do the rest. 1872 * below the second grid line). 1873 * Find the last grid line index2 which is above nextTrimVert. 1875 * leftGridChain, leftGridChainStartIndex+1, index2). Referenced by sampleCompLeft(), and sampleLeftStripRecF(). Definition at line 1219 of file sampleMonoPoly.cc. 1269 //we triangulate anyway, and print out error message. 1352 /*(1) determine the grid boundaries (left and right). Definition at line 1401 of file sampleMonoPoly.cc. 1415 /*find the first connected component, and the four corners. Referenced by sampleMonoPoly(), and sampleMonoPolyRec(). Definition at line 2368 of file sampleMonoPoly.cc. Referenced by sampleBotLeftWithGridLinePost(), sampleCompBot(), sampleCompTop(), sampleLeftOneGridStep(), and sampleTopLeftWithGridLinePost(). Definition at line 346 of file sampleMonoPoly.cc. Definition at line 2258 of file sampleMonoPoly.cc. 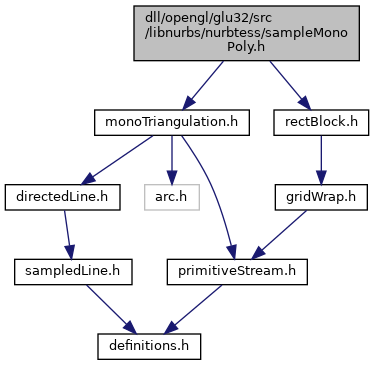 Referenced by stripOfFanLeft(), stripOfFanRight(), and triangulateConvexPolyHoriz().